Any quantity only $4.19 per oz over spot! There are few silver bullion coins in the world that match the quality and craftsmanship in design of the Canadian Maple Leaf or Silver American Eagle coins. Among the few coins considered equal to those is the Silver Austrian Philharmonic coin. The Austrian Philharmonic was first issued in 2008, and today it is the highest minted and most well-known coin from Europe. This 2009 1 oz Silver Austrian Philharmonic coin is now available in brilliant uncirculated condition. 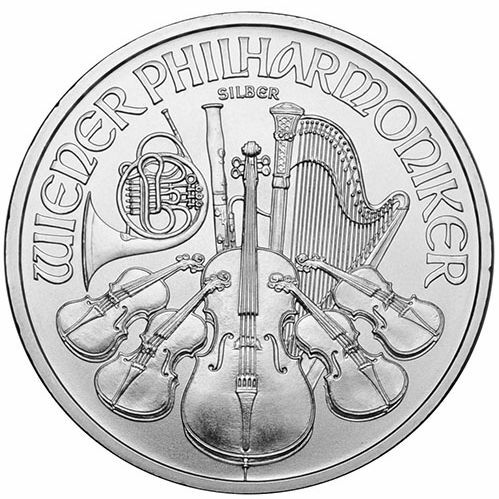 The Austrian Mint first issued Silver Philharmonic coins in February 2008, and began with a massive initially minting of 7,730,000 coins. As high as that figure might seem, it actually represents that lowest minting year in the coin’s history to date. 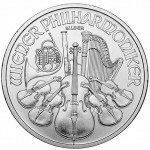 The 2009 1 oz Silver Austrian Philharmonic was developed using the same design that Thomas Pesendorfer created for the Gold Austrian Philharmonic coin, which was first released in 1989. 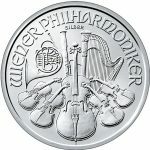 Just like many of the other national silver bullion coin programs, the Austrian Philharmonic features the same design on each side of the coin from one year to the next. On one side is an image depicting the inside of the Musikverein concert hall in Vienna, while the other side boasts the image of numerous musical instruments used by the members of the Austrian Philharmonic group. The obverse side of the 2009 1 oz Silver Austrian Philharmonic coin features the image of a pipe organ found inside the Musikverein. Engravings on this side of the coin include the German words “REPUBLIK OSTERREICH” (Republic of Austria) and “1 UNZE FEINSILBVER” (1 ounce pure silver). The face value, in euros, is also engraved on this side, along with the year of minting. On the reverse side is a cornucopia of musical instruments used by the members of the Austrian Philharmonic. The image includes depictions of a harp, violin, cello, flute, bassoon, and French horn. Engravings on this side include the German words “WIENER PHIHARMONIKER” (Vienna Philharmonic) and “SILBER” (Silver). The Austrian Mint was first opened in 1194 by Duke Leopold VI of Austria. Its first duty was to mint 15 tonnes of silver given to Leopold by England’s King Richard the Lionheart. Today, the mint is responsible for the production of the nation’s circulation and commemorative coins including the Philharmonic Coin Series. If you would like to speak with a member of our customer service team regarding these coins or anything else, feel free to call us toll-free at 1-888-989-7223. You can also get in touch with us directly through our website on live chat or by email.